A “Fox & Friends” segment about marijuana devolved into “Reefer Madness” hysteria Monday. 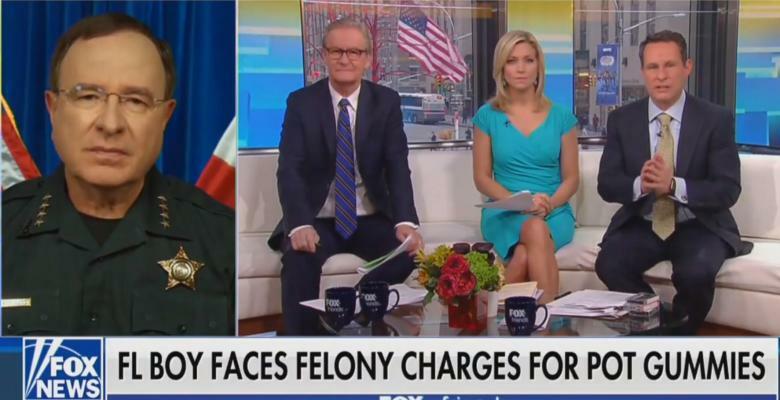 The segment featured Polk County, Florida Sheriff Grady Judd who came on to talk about a 12-year-old who gave his classmates THC-infused gummies. “It is ruining families and killing people every day across the United States and we stand here in denial thinking that it’s not a gateway drugs to drugs killing people,” he claimed without any evidence. “A Cautionary tale,” host Steve Doocy concluded. There is no such thing as a marijuana overdose: The Drug Enforcement Administration, which considers weed highly illegal in the same classification as heroin, has said there has never been a reported overdose death from marijuana. “A fatal overdose is unlikely, but that doesn’t mean marijuana is harmless. The signs of using too much marijuana are similar to the typical effects of using marijuana but more severe,” the Centers for Disease Control website says. Alcohol and tobacco, which are perfectly legal and unmentioned in the segment, kill an estimated 500,000+ Americans per year, far more than even opioids. "None of this is true! Not a single part!​" wrote Vox senior reporter Jane Coaston. "When you've come to a conclusion—that criminalization and crackdowns are the solution—and are looking for evidence to support it, you end up in some unfortunate places," wrote Esquire's Jack Holmes. "That's why Judd has to insist marijuana is addictive (this is extremely rare), that it's a gateway drug (this is not supported by the evidence, and overdoses fell in areas where it was legalized), and somehow conflate marijuana and meth use. No honest person who has used marijuana would put it on the same continent as meth, or heroin, or cocaine. The science indicates it is safer than tobacco or alcohol. There are zero recorded cases of someone dying from a marijuana overdose. In 1988, a DEA judge suggested a user would have to ingest around 1,500 pounds of marijuana within 15 minutes to reach toxic levels."